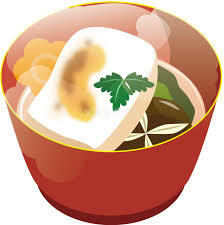 Ozoni or Zoni is a rice cake and vegetable soup and one of the New Year's dishes. Flavor and ingredients, including meat or fish and all kinds of vegetables, differ according to the region or family. Generally speaking, zoni with square-shaped rice cakes in clear soup is preferred in eaten in eastern Japan, while zoni with round-shaped rice cakes in miso soup is eaten in western Japan.